Taleemul Quran Radio FM 92.9 provides the best Islamic programs for you. This station has been designed to give you the best Islamic experience no matter whether you are living in Kandahar, Afghanistan or anywhere else in the world. It is popular radio Station in Kandahar; its aim to extend the voice of Islam worldwide Insha Allah. In Taleemul Quran Radio you can listen to tracks like Spoken. This is an Islamic radio station broadcasting ethical program in both English and Arabic from Kandahar, Afghanistan. Also provides accurate information about Islamic beliefs and practices, children programs, political issues, social and Islamic music. A major aim of Taleemul Quran Radio is to promote the message of Islam. It has also become synonymous with Islamic values and a tool to dispel misconceptions relating to Islam and Muslims in Middle-East and abroad. It provides programmes for women, children’s shows, quiz shows, fiqh sessions, Taraweeh prayer, and shows such as Daily Halaqa, Qur’anic class, Easy Talk, Drive Time and others, in English and Children’s Show. Other popular programs are, Dhikir AM, Quranic Pearls, Women’s Hour, Charity Fundraising etc. To know more about their programming you can visit its website: http://www.t-quran.com. Taleemul Quran Radio is opposed to discrimination based on gender, race, political persuasion, class, religion, belief, language and disability. The station has become a beacon of Islamic guidance and an invitation to the world. 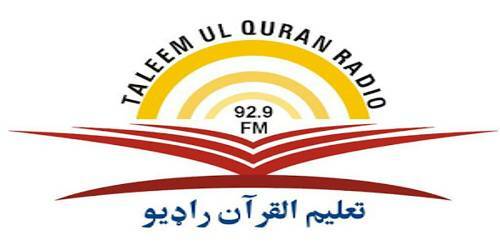 Taleemul Quran Radio Station is directed by an independent committee led by qualified financial controllers and other qualified community figures sought to represent the community and religious interests. Taleemul Quran Radio comes to life with the charisma of its highly educated, talented, and committed team. Tune to enjoy this radio right now. Liveonlineradio.net has Taleemul Quran Radio– http://www.liveonlineradio.net/afghanistan/taleemul-Quran-radio.htm, in its listings. Just click and enjoy.